COTS products affect development strategies and tactics, but not all CBS development efforts are equal. Based on our experiences with 20 large government and industry CBS projects assessed during our development of the COCOTS estimation model, and our hands-on experience with 52 small e-services CBS projects within USC’s graduate level software engineering course, we have identi.ed four distinct CBS activity areas: assessment intensive, tailoring intensive, glue-code intensive, and non-COTS intensive. The CBS activity type fundamentally affects the COTS related activity effort and project risks. 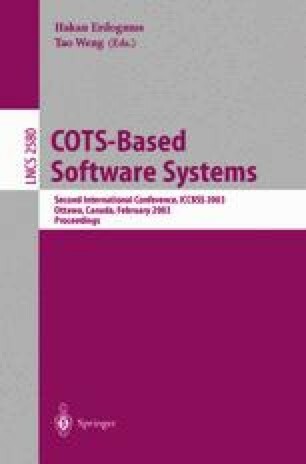 In this work we define the three COTS activity intensive CBS types and discuss their strategic comparisons based on an empirical study of the spectrum of large and small CBS projects.